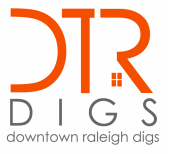 Below is a summary of the residential options for single family homes in/near downtown Raleigh. Overwhelmed by the choices? That's where a good buyer's agent can help. Contact a Metro Digs agent today and we can help you navigate your options for living in downtown. Another great neighborhood with old homes, Boylan Heights is west of downtown with easy access to the Warehouse District. Listed on the National Register of Historic Neighborhoods, Cameron Park is a prestigious address. Find a fixer upper or that million dollar dream home, because this neighborhood has it all and is a 5 minute walk to Glenwood South and Cameron Village. Full of mid century architecture, Cameron Village is where you'll find a nice ranch. Recently added to the National Register of Historic Places. Just a few blocks east of downtown, many homes along Hargett, Martin, Davie, Cabarrus, and Lenoir are being renovated. (suggest doing a map search to dig further in this area). Just north of Glenwood South, these homes provide the convenience of being within walking distance to places with the charm and space of a home instead of a condo. More bungalows, cottages and traditional homes, Mordecai is walking distance to Seaboard Station shops. If you like front porches and tree-lined streets, you'll love Oakwood. Victorian homes, bungalows and other great architecture dating back as far as the 1800's. If you want to live close to downtown but can't imagine a home without a yard, consider Oakwood. Only about 2 miles from downtown, Longview Gardens offers space for those who want proximity, but desire a larger lot and square footage. Also, Longview has some of the more affordable homes that close to the core. Located east of Wake Forest Road, across from Mordecai, you will find Oakdale, aka East Mordecai. Bungalows and cottages can be found here, some renovated, some not. A lovely little dense neighborhood walking distance to Seaboard Station and the Brookside market. There are also new, large homes being built in Oakdale in the former "Tiny Town" area that start in the $600's. Contact us for more info. South and east of downtown lies an historic neighborhood called South Park. Starting in 2014 and 2015, the amount of homes available in this area has surged. Located just east of downtown, this area is experiencing a rebirth (suggest doing a map search to dig further in this area). Newer home community behind Seaboard Station. Re-sale homes start in the $350,000's and go up to the $500's. Two car garages and plenty of space for those who want to walk to shops but need more square footage in their home.